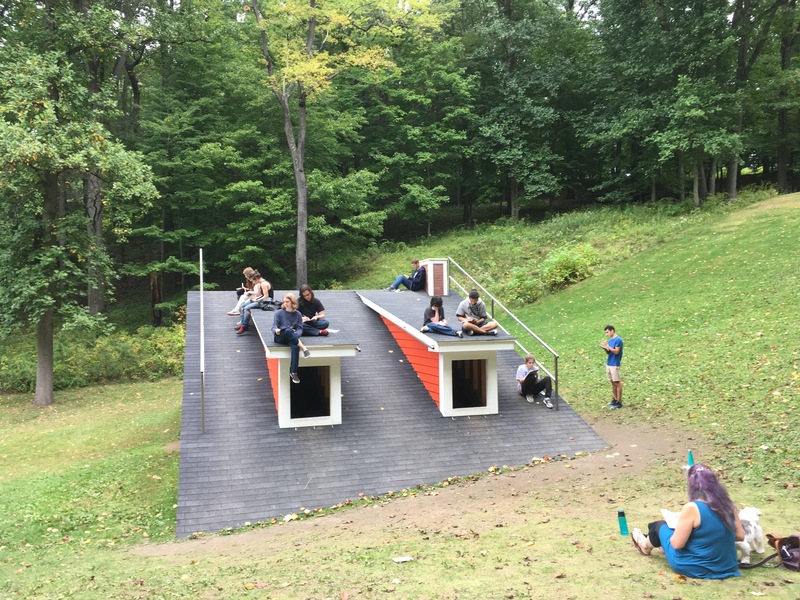 Our group of high school students had arrived via van, to the world famous home of monumental outdoor sculpture: Storm King Art Center. They had been told their English class would focus on Art and Social Justice, and this was part of the class. Once a week we would visit the center and write. We arrived in the early afternoon. The late summer heat and smooth breezes were refreshing and familiar. A few students spied monarch butterflies and dragonflies. Wildflowers and mushrooms graced the edges. We were all grateful for this weather, stretching the sunny warmth into the encroaching fall air. This was a day to be outdoors. My colleague Karen had planned the lesson for today, based on her experience at a teaching workshop at Storm King Art Center this summer. “Art. Story and Social Justice” was a four day workshop offered by the Hudson Valley Writing Project This workshop for teachers from preschool to college explored ways educators can draw on art to build community. HVWP is a local affiliate of the National Writing Project, and The Birch School is affiliated with the NWP as an Educator Innovator/LRNG grantee. Karen’s excitement and anticipation for today’s class was contagious, and as our group walked together to visit the first sculpture students’ curiosity increased. We spotted our destination as we approached on the gravel path. A large, angular, rooftop on a red building caught our attention. As we got closer we could see that this roof was just that: a roof. It did not have a house underneath it. Students were invited to explore the sculpture, walk on the roof, look in the windows, and experience the sculpture. After some time for exploring, our teacher and guide invited us to ask questions about what we were seeing. Students wondered about the artist, what would happen to the piece when it’s installation was complete in a few weeks, if the nearby sculptures were part of the piece, and what was it called? Oracle of Lacuna (2017) is the name of the piece by Heather Hart that students were studying. This art gave them a focus for writing. With several prompts from their teacher they were encouraged to put their thoughts on paper. The exceptionally beautiful day, and the fact that there were very few visitors at the center this afternoon, created a peaceful and contemplative atmosphere that students basked in, Looking around as the class went on I saw students fully engaged in writing. The teacher gave students three writing prompts. Each was slightly different, but focused on the sculpture as inspiration. As she described each prompt, students immediately settled into a writing spot, most sat alone, scattered across the rooftop. Staring out across the stunning landscape, or head down with fingers busily writing, all were truly engaged in the experience in an incredibly unique way. The contented energy and focus translated into a good amount of writing, much of which students were willing to share with one another. Here we discovered another pleasant surprise of the experience: happy student engagement and enthusiastic peer support. Before we knew it we were preparing to head back to school. Students weren’t done sharing their work with each other, but we promised to revisit this in the classroom, since our afternoon time was up. We had spent nearly 2 hours at the Storm King Art Center, but it had seemed like minutes. We chose to walk back to our van via a different path, since there is so much inspirational art to be seen at Storm King Art Center. Students clustered in groups as they walked, pointing out the art and asking which piece we might visit next time. Back at school we checked in with students, asking what they thought of the experience. One student’s comment summed it up: “The afternoon went so fast. I hadn’t realized we had spent so much time there,”. I am pretty sure I am not the only one looking forward to next week’s trip to Storm King Art Center.